Will an incumbent congressman go down? And will Clay Aiken win? The second storyline is the competitive House GOP primary between incumbent Rep. Walter Jones (R-NC) and Republican challenger Taylor Griffin, who worked in the Bush administration. This, however, isn’t your typical establishment-vs.-Tea Party primary -- Jones is anti-war, and Griffin has questioned his GOP credentials. And the third storyline in North Carolina is former “American Idol” star Clay Aiken’s (D) congressional bid for the seat held by Rep. Renee Ellmers (R-NC). But as Roll Call wrote last week (with the clever headline “Clay Aiken Could Be Runner-Up in House Primary”), the singer is hardly a slam dunk to win the Democratic primary. “Aiken reported disappointing fundraising. Privately, North Carolina Democrats said his campaign spent too much money on initial start-up costs and consulting fees — and not enough on direct voter communication.” Of course, Aiken isn’t the first celebrity to run for Congress, the Senate, governor, or even the White House. Look at all of these singers and actors who actually won: Fred Gandy (who played Gopher on “Love Boat”), Ben Jones (who played Cooter on “Dukes of Hazzard”), Sonny Bono, Al Franken, Jesse Ventura, Arnold Schwarzenegger, and Ronald Reagan. Polls close in North Carolina and Ohio at 7:30 pm ET, and all polling places in Indiana will be closed by 7:00 pm ET. One more story to watch in North Carolina is something we noted a couple a weeks ago: Democrats have tried to influence the Senate GOP race by portraying Tillis as a squish on the health-care law. Here’s the Washington Post: “The fliers landed in the mailboxes of Republican voters here last week with a warning likely to unnerve many conservatives. Thom Tillis, the Republican front-runner for a U.S. Senate seat, once called President Obama’s health-care law ‘a great idea,’ the mailer said. The assertion echoed recent radio ads that also seem to question Tillis’s adherence to the orthodoxy of a party that has made its opposition to the Affordable Care Act a centerpiece of its midterm-election strategy.” But as the Post writes, these didn’t come from Tillis’ GOP adversaries -- rather, they came from Sen. Kay Hagan’s (D-NC) campaign. But unlike Claire McCaskill in Missouri in 2012 with Todd Aiken, Hagan has not spent nearly the same amount of money trying to topple Tillis; it’s been more of a dabble of sorts. 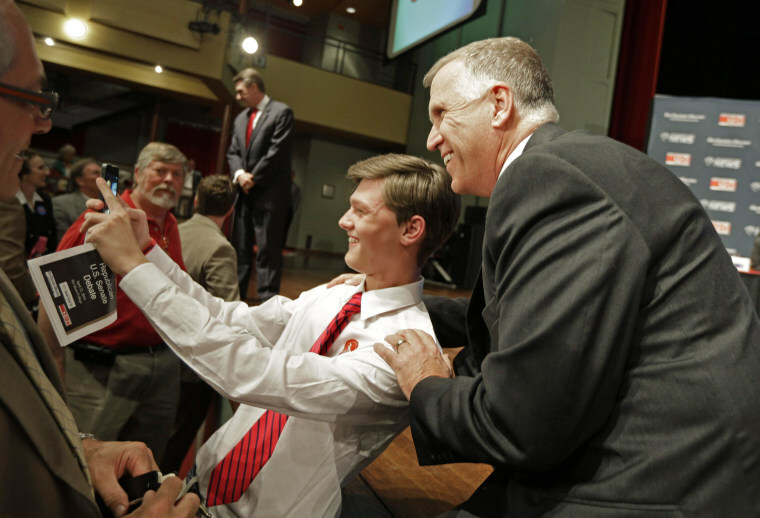 Then again, if Tillis is forced into a runoff, don’t be surprised if Hagan’s dabble becomes more aggressive. While Ohio doesn’t have any attention-grabbing primaries tonight, the Buckeye State will feature one marquee contest we’ll be watching in November (or at least we thought it would be marquee) -- the gubernatorial race, especially given Ohio’s importance in presidential elections. But one of the more interesting stories of 2014 is how Gov. John Kasich (R) is in better shape than anyone would have predicted two years ago after he got bogged down in an unsuccessful fight to change collective bargaining in the state. According to a Quinnipiac poll in February, Kasich’s approval rating was at 51%, though he was leading likely Democratic challenger Ed Fitzgerald by just a handful of points, 43%-38%. Make no mistake: Given that this is Ohio, the race will likely be close. But Kasich -- at least right now -- looks stronger than the early conventional wisdom heading into 2014. And there are a number of reasons, 1) the economic outlook in the state is MUCH better today than it was in 2012, 2) Kasich seemed to learn from the shellacking he took on his fight with the unions, and 3) Democrats struggled to find what they thought would be an “A” list challenger. Not saying Fitzgerald can’t win, but he was definitely farther down the list of potential recruits the party was looking at. Politico’s Maggie Haberman wrote that Hillary Clinton will attend a fundraiser on May 15 for her daughter’s mother-in-law Marjorie Margolies -- representing Hillary’s first campaign activity of the year. And guess who’s hosting the fundraiser? None other than Lynn Forester de Rothschild. If you’ll recall, Lynn Forester de Rothschild was so disappointed by Obama’s primary victory over Hillary, she campaigned for McCain-Palin in 2008 and backed John Huntsman in 2012. Also, as Slate’s Dave Weigel reminds us, she said that Obama “being half black” doesn’t make him qualified to be president.